The problem of the “feral”, “stray”, “abandoned” and the preferred “outdoor living” or "free roaming" cat is hidden throughout our communities. These cats are rarely seen, but always heard. The screeching, screaming, howling, and hissing, nights of the feral cat, can soon pass into history with a small and simple procedure called - “neutering”, “altering”, “fixing”, “spaying”. All words to describe the solution to this hidden, almost secret community problem. Its not up to the cats to fix this, it is UP TO US HUMANS! Cats have the will (and the emotion), as all animals do, including us, to make conscience choices. And when it is thrown outside for behaving the way nature made it, and it cries at the door to come back in and it is not let back in, essentially it has been abandoned to the outdoors for being a cat. This was not a choice the cat has made. It wants back in. But is not let in. Eventually it is picked up, tired of hearing its cries, and driven miles away dumped somewhere in the big world never to be seen again. Unless a savior is found. If the cat doesn't starve to death, or die from predation or car before one can be found. It takes a very special person to step up and be the one to extend a hand in kindness and friendship to this pathetic creature in need. We are better today in understanding the types of cats who live permanently outdoors, in need of altering and a better life. This information has been gathered through observation over the last 5 years. 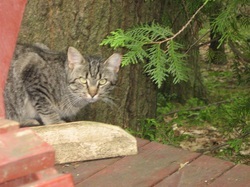 The behavior of the “feral” cat is not the “wild” crazy behavior that comes with the word feral. It takes several generations of a colony to be truly “wild” creatures of the forest. This generation can sustain itself and its offspring's on hunting alone and does not require human interference. Their bodies have adapted to the environment and can combat parasites and predators. A “wild” animal is an animal who can sustain its own life without human interaction or interference. An outdoor living domesticated cat can only survive with the help of humans. The amount of cats living outdoors that need our help is phenomenal and overwhelming. We like to consider ourselves intelligent and informed beings, accept when it comes to the number of cats living outdoors. We know there are a lot out there. Times that by ten and you are close. At least these are the ones we know about, how many do we not know about? The difference between a feral cat and a friendly cat is how it is nurtured. It doesn't matter if the cat is born outside or inside, if it receives the proper nurturing of soft words, and a gentle touch, the cat will quickly learn that humans are safe to trust and depend on. Humans are friends and not foes, because the special part of the cat's personality and make up has been nurtured. If the kitten is treated with harsh slaps and kicks, loud voices that are only meant to scare, it will soon learn to stay as far away from humans as possible. The “feral” cats that live in people's backyard's, barns, sheds, garages, downtown alleys, etc are homeless domesticated cats that live outdoors, who originated as a family pet abandoned to the outdoors against its will. These cat's will literally knock on someone's door as if to say “Help me. The human I was living with put me here against my will”and I don't know why. They are forced to search their ancient instincts to hunt for food and find shelter; not all are successful at this. Most people will feel sympathy for these cats and put food out for them and provide some sort of winter shelter. Once this is done the cat has basically found a savior, a hero, someone who will step up and say this creature cannot sustain its life on its own, it needs our help. The cat(s) may start to remember that there was a friendly human in their past and start to trust again. And if there are kittens they will follow the mother's behaviour. If the cat does not find it's way to a house with food, and companionship or accepted in a colony that already exists the cat will slowly perish from, dehydration, malnutrition, starvation, an injury from fighting or hit by a car, or get infected with one of the many fatal viruses, and finally predation. A cat can be nurtured at any age. It is just easier and quicker the younger they are. I would like to tell you the story of Simba and Salvador. Born to a mother cat named Lily, in downtown Campbellford. The only human kindness they knew was from a elderly gentleman who fed them. When the only human they knew had to move, the cats needed to be relocated. Because of their lack of experience with humans and never being in a house, they chose to stay outside. When they came to my home, Simba and Sal were 7 months and Lily was over a year. I wasn't surprised when Lily didn't stay, but was overjoyed when I realized Simba and Sal were staying around. I like to believe that Lily made her way to a neighboring farm and is living there happy and healthy. Sal was the first to become my friend. It took only 2 months to nurture that special part in him. He decided to come inside for a little while when he had a boo boo in his bum. He somehow knew he would heal if he hung out inside for a little while. He spent a month or so sleeping on my bed with me and the other cats and getting pilled twice a day. When he was all better he decided to return to the outdoors. Simba took a little longer. The first time he attempted to come inside did not go well or last very long. He looked through the sliding glass door into the kitchen as I opened it with an invitation to come in. Once he was in he ran to the other side of the kitchen, straight into my indoor cat Bastian, had a tumble with him and ran right back out. The second time lasted a bit longer. He came in through the front door, ran around the living room, then kitchen, then back out the front door. The third time he came in, by his choice, he literally crawled up the wall by the front door to get out. Both cats don't even want to come in when it is -25 Celsius in the middle of January. There was a time when Simba contracted an upper respiratory infection. Because he was so sick his first instinct was to hide and then to run from me. I had to use a special cat net to catch him. With cats like Simba, who have minimum human experience, you have one chance to trap them, if you mess it up, you've missed your chance at catching the cat. We were both lucky that I was successful and got him to the vet. He hadn't eaten in about 4 days and was dehydrated and fading. Because he couldn't smell his food he wouldn't eat anything. I thought I was going to loose him. I had to bring him inside to nurse him back to health. Because these two brothers had never been separated and I didn't want either of them to get depressed, I brought Sal inside too. Having them both inside for about 2 weeks strengthened our bond, especially with Simba. I had to force feed him on my lap. He was too week and sick to fight me. But because of his illness I have a much more trusting relationship with both Simba and Sal. I am very proud of these two cats. They have been making decisions, and choices about their life from the start. They have been given the opportunity to decide for themselves what they want their lives to be. They both chose a life outdoors. Not because they weren't nurtured at a young age, but because it is what each wanted for himself and they were allowed to make the choice. By the time they were 3 years old Sal had decided to move to a neighboring farm and Simba was alone for the first time. Once the weather became cold Simba made the difficult decision to move inside to be with the other cats. He knew he would not be able to keep himself warm through the long cold winter. I have always asked the question to Simba, since Sal's departing, “when are you going to come in? It's getting cold”. I suspected that Simba was considering coming in, he kept poking his head in the door every time I opened it and asked the question. One day when I asked, as I was entering my house, I was completely surprised when Simba walked right in, holding his head high and allowed the other cats to approach and sniff, as he knew they would. I was so proud of him, how he walked right in with every intention of staying in. I opened the door for him a few times to make sure he was ready to be in and he never even noticed. 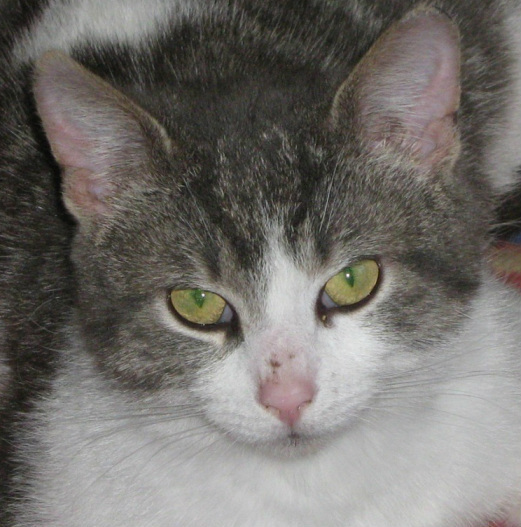 He continues his life indoors and is a happy cat who loves a gentle stroke now and then. If I didn't know any better I would think that Simba was born and raised indoors. I have another outdoor living cat who was relocated to my home the same spring Simba and Sal arrived. Zacharie is his name and he was 7 months old when he came. Again, nurturing the right parts of Zacharie made him my friend in no time. He also made the choice to experience the indoors, like Simba, he simply walked in one day. He wasn't sick, he just wanted to make friends with me and the indoor cats. It took him about 3 months to decide to come in. He went in and out for awhile but finally decided the outdoor life was no longer in his blood, and he came in for good. I have an outdoor enclosure (aka catio) that all the indoor cats enjoy and it satisfies their taste for the outdoors. Sometimes he remembers his days outdoors and occasionally will ask to go out, but he doesn't really mean it, he gives up quickly when he realizes he doesn't do that anymore. Cats can also change their mind and return to the outdoors after being a regular house cat for a while. Fluffy is an outdoor living cat, born in a small colony, first generation born outside, living in the backyard of a lady who takes care of the colony. The lady works hard at nurturing the right parts of these few cats. 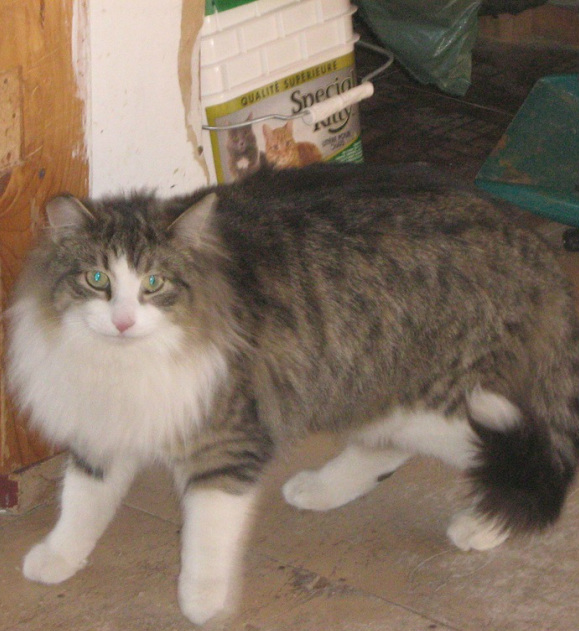 Fluffy became so friendly with the lady that he started coming inside and spending the nights with her on her bed. Then one day Fluffy did not come home. He did not come home for months. The lady feared her favorite cat was lost to her. As quickly as he disappeared, he reappeared. Only this time he made the choice to stay outside. He still loves his lady and will let her get a pet in now and again but his heart is to be outside with his colony-mates. Carter, another cat who choose to come indoors, note the claw marks on his nose from fighting other males for territory or mating rights. Carter was loving and friendly from the start. Every outdoor living cat is capable of being a friend to humans whether it is the first, second or last generation living outdoors. Like every other life on this planet, cats need to be nurtured to know its full potential. A domesticated cat living outdoors, of its own will or that of another, can be nurtured with love and kindness at any age and become a friend again to us undeserving humans. Animals are a gift to us from God. For animals, life is all about the love, and they are here to show us the way to that love.